One of the most beloved winter activities for kids and kids at heart is sliding down a snowy hill. Sliding down a hill can be done on an inner tube, a piece of carpet, toboggan, or sled. But the all-time favorite is sliding on an air-filled doughnut (or chambre à air). The only drawback of practicing this popular winter activity in the city is availability. The island of Montreal has very limited inner tubing rental possibilities and they're only available during the day, which makes bigger kids and adults stand out. To satisfy the tubing craze for all ages there are some amazing destinations that are a bit more of a drive outside of the city limits, but worth the time to get there. The only other park in Montreal that rents out inner tubes is Parc Jean-Drapeau, specifically during Montreal snow festival Fête des Neiges, running weekends only from mid-January to early February. Exact season dates are available each year on the festival website. This upcoming year, you can tube on weekends from January 19 to February 10, 2019, from 10 a.m. to 5 p.m. Tube rentals are $16. The festival has a wide range of activities for everyone. Slide on the ice boat, go for a dog sled ride, try your luck in ax throwing. Access to the Fête des Neiges and to the majority of activities is free. Only a few activities must be paid for (dogsledding) or require the ACCROPASSE (Sliding tubes, Zipline, and Big Jump). There are restrooms, warming areas, snacks for sale and food trucks. 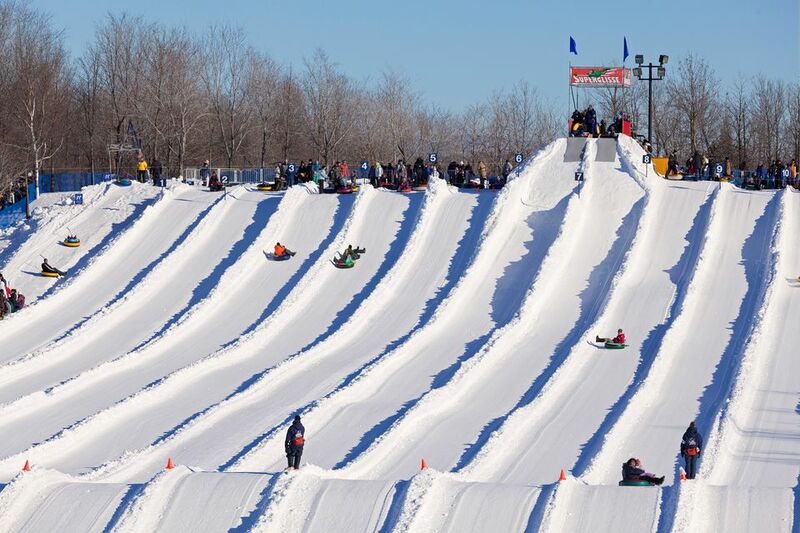 Montreal's best-known park is one of the only parks in Montreal that rents snow tubes throughout the winter season. Mont-Royal's inner tubing season is expected to run from mid-December through the first week of March. Hours are from 10 a.m. to 4 p.m. Monday to Friday and 10 a.m. to 6 p.m. on Saturday and Sunday, weather permitting. The run closes at 4 p.m. on December 24 and December 31, 2018, and closes all day December 25 and January 1. The Friends of Mont Royal (Les Amis de la Montagne) Facebook page usually announces the opening of the season. Inner tube rentals usually cost $9 for ages 12 and up and $5 for ages 4 to 11 for the day. There are restrooms and snacks available nearby. About a one-hour drive outside of Montreal, this location is for serious tubers only. With 30 tracks open all day and illuminated at night, 17 are dedicated to snow tubing. The rest are for snow rafting, where the runs can reach speeds of up to 100 km/hour on, especially cold days. Skating, carriage tours, snowshoeing, and cross-country skiing are also offered on location. The season runs mid-December through March. Prices for inner tube rentals are on the website. Restrooms and snacks are available. Head north and check out five groomed slopes at Laval's Centre de La Nature. Go ice skating and cross-country skiing and, of course, tubing. The season usually runs mid-December through March. Inner tub rentals usually run $5 for 90 minutes. Watch the Centre website for opening details. There is no fee for entrance to the park but there is a charge for parking. There are restrooms and snacks available. Roughly 45 minutes out of town, the kids can enjoy a snow tubing spot that won't break the bank. Skating, cross-country skiing, and snowshoeing are also on the activities roster. The cross-country ski school Première Neige offers lessons for children from 4 to 13 years old. Slopes open mid-December through March. Inner tube rentals and daily access to the snow tubing slopes is usually $8 for a day. There are restrooms and snacks available. Offering everything from rafts to inner tubes for your sliding pleasure, you can slide down any one of three trails and then be whisked back up to the top via the lift. Adult rates start at $23.99 for 2 hours.